There are very few events that bring as much happiness to people as weddings do. However, when the financial aspect of a wedding starts tearing your saving down or even threatens your couple, it might the time to considerer something else than a grandiose ceremony with doves flying around and a 5000$ dollars’ dress. The main point of a wedding should be to unite your destiny with the person you love in front of your family and friends. Organizing a wedding on a very tight budget might not be as glamour as booking a top-end venue but it is possible to do so. 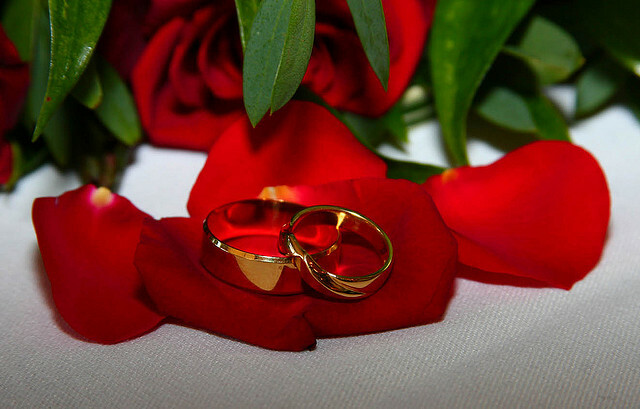 Within the following minutes, we will give you tips to organize a nice wedding under 1000 USD. This may sound absurd for some people, but you CAN and you sometimes SHOULD book a free venue if you want to save on your wedding’s expenditures. What can it be? If your home is pretty big and could host 20 to 30 people, or if you know a close one that has such a venue, why not make it this intimate? Remember that this article is for people that do not want to go into debt for uniting their life with someone. You probably have many relatives that could lend you tables to set-up in your garden. Do buy a few decorative accessories – one or two floral centerpieces, a beautiful tablecloth – and, if you know someone artistic, ask him or her if he can design special napkin holders. It doesn’t have to be fancy; people will like it if they see that you have put some effort into making the day special. Wearing a white dress at a wedding is definitely something that most girls dreamt about. Do not sacrifice your dream because of your wallet. However, search for companies that will offer discount wedding dresses: you might be able to pay between 100$ and 300$ for something that would normally cost over a thousand. Another way to save a lot could be to rent a wedding dress. People usually buy wedding dresses to store them in a closet for the following 30 years: this is absolutely not necessary in your case. You will have access to higher-end products than if you went for cheap dresses: the rental generally includes the gown, the veil, a crinoline and a head piece. Expect a price tag of 350$ or more, though. It is possible to spend a lot of money of wedding flowers. While professional florists will create beautiful bouquets, you can find interesting products if you find a supermarket with a quality flower section. You could even create yourself beautiful bouquets for the bride and her bridemaids by shopping in flower farms that sell to the public. If you still want to deal with a florist, simply be very honest about your budget and ask for flowers that are in season at the moment of your wedding. If this professional is not ready to think about money-saving practices, just visit another one! A wedding generally includes a professional photographer to keep memories of this moment. Instead of hiring a pro, do you know anyone that studies photography or that has this hobby while having a very good camera? Make a few phone calls and you could save 50% or more on your wedding photos. Luxurious food also tends to eat a big chunk of your budget… in this case, why don’t you go for a regular cold buffet that people usually eat with great pleasure? Sandwiches, tasty salads, small bites… you could even have a cooking party with your bridesmaid the day before the event! Whether you choose to follow these tips or not, we hope your wedding will be memorable and affordable. Charles Bernard is a Canadian blogger with a Bachelor Degree in Marketing and International Business. He closely follows the car industry and likes to teach a few things every day to his readership.